Get cooking with one nylon tool that handles four essential tasks. 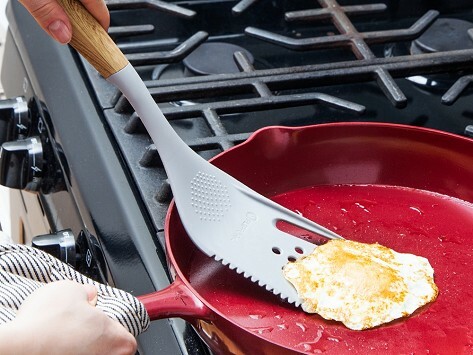 This 4-in-1 spatula does flipping jobs and has a built-in fork, knife edge, and serrated edge, too. Want to get zesty? The integrated spice grater is great for that. Dimensions: 13.75" x 3.75" x 0.25"
Makers Joe Lerario and Craig Rapihana were inspired to make a BBQ multi-tool—when else—while grilling, of course. Trying to handle a spatula and fork (and using a too-small kitchen-size fork for meatier jobs) made the duo want to streamline all the essential functions into one tool. Out at the grill, the heavy-duty BOSS packs five tools (spatula, fork, knife blade, serrated blade, and bottle opener) into one stainless steel and wood-handled tool. Cooking inside? FLEX is the scaled-down nylon counterpart suited for kitchen cooking. It works as a spatula, fork, serrated edge, and spice grater. By putting their heads together and combining all the must-haves, Joe and Craig have made a way to eliminate the all-the-utensils clutter. So you can focus on the cooking job at hand.